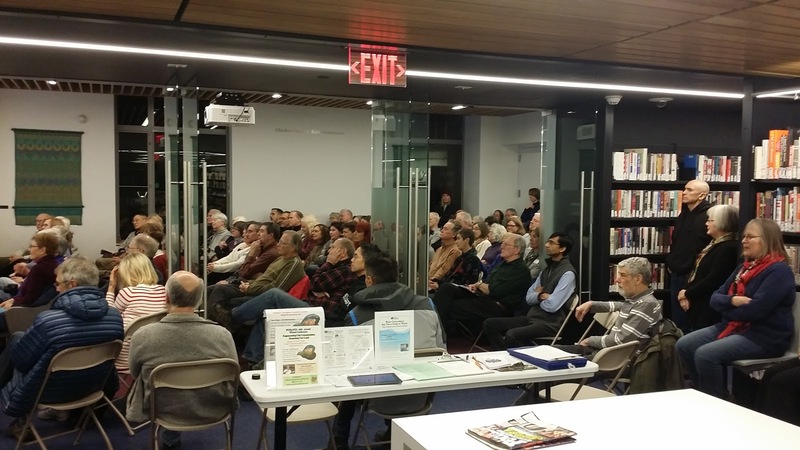 Thanks to the Mercer County Master Gardeners and the Princeton Public Library for bringing NJ's climatologist, David Robinson, to Princeton this past week. Here are some notes from the presentation. 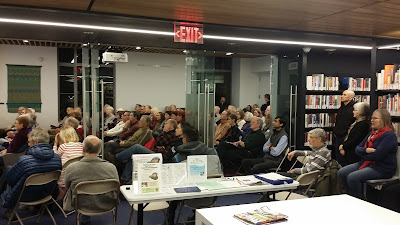 Unlike events on climate change years ago, this one was packed, with the audience spreading out into the hall. Robinson is an excellent ambassador for the subject of climate change. As I was taught by a theater director, even the darkest subjects or emotions must be presented with some element of joy, and Robinson does that. Climate is your personality; weather is your mood. A drawing of the biosphere, cryosphere, and atmosphere. Cryosphere is his favorite. Editor's comment: The cryosphere is all the frozen water on the earth, in ice sheets, glaciers, snow, ice caps, etc. The cryosphere has been doing a lot of "crying" as we warm the planet with our machines' emissions, and if all of it melted, your house would likely be under water (unless you're higher than Nassau Hall), which is one reason to be grateful for cold in our world. Princeton was home to the foremost expert on the history of weather, David Ludlum. You can see the urban heat island effect in the temperature patterns of NJ. Seemed like a five degree difference on the map. Air conditioners belching out heat, and the solar energy absorbed by asphalt, concrete, etc. extend hot spells. While NJ was experiencing extreme cold recently, the rest of the world was warmer than usual. There's 7 inches of evaporation happening in July/August, which means that even if we get 5 inches of rain, the ground is getting dryer. He doesn't use the word "believe" with climate change. It's not a matter of belief. It's a matter of understanding what's going on. It's hard for a lot of people to understand the difference in time frame between climate past and now. Human activity (the combustion used to power our machines) is changing climate much faster than it would happen naturally. El Nino and La Nina may not be completely natural anymore, given how much we've heated the oceans. The gases in the atmosphere--CO2, methane, etc.--bring the temperature of the earth's surface from zero degrees up to 55 degrees F.
The oceans are absorbing huge amount of the excess heat caused by global warming. Because there is so much extra heat already in the system, "the train has left the station" with climate change. Reducing emissions of greenhouse gases will slow climate change rather than stop it. NJ precipitation showing increased variability. "We're primed for more storms." Hurricane Sandy rode ocean waters that had been above normal for 22 months leading up to the storm, plus a seasonal dip in the jet stream that caused the storm to come in towards land. hotter summers are predicted. The snowpack out there this winter is only 6% of normal. Dr. Robinson mentioned Katharine Hayhoe, a climate scientist, evangelical, and an excellent speaker, based at Texas Tech. Editor's note: She is also a longtime member of the advisory board for Citizen's Climate Lobby, which has a local chapter. There's a weather station at Stonybrook/Millstone Watershed. Nice photo of the Great Falls at Patterson during the recent deep freeze. In the Q and A, I asked him about how people are to learn about climate change when journalistic convention doesn't include basic facts in day to day reporting, like the graph showing the dramatic departure from historical patterns of temperature and CO2, or how we've raised CO2 levels in the air by 40%. He said that he only gave 160 interviews this past year, half of previous years, which for him is telling about the diminishment in science reporting as news services struggle to survive. Clouds are hard to "parameterize" in climate models. They'll have different impacts depending on whether they are over dark water, land, or snow that would reflect the light back up into space regardless of whether the clouds were there. Research shows that the main determinate of view of climate change is ideological. He had expected climate change to get more attention when Clinton/Gore were elected, but Clinton administration had lots of other things on its agenda. Someone asked about the 3% of climate scientists who supposedly disagree about the amount and cause of climate change. Robinson questioned whether that 3% really exists. If you want to see some of his slides, an internet search revealed that ANJEC (an umbrella organization for town environmental commissions) has one of his powerpoints at this link. After the talk, an acquaintance confided that she still didn't understand the basics of how the extra CO2 got into the atmosphere, and why it is a problem. A NY Times primer on climate change explains to some extent, but still doesn't make clear that the extra carbon, now active in the atmosphere warming the earth, was previously safely stored in underground deposits of coal, oil and natural gas. Both the origins and dangers of human caused climate change have a great deal to do with storage. Coastal cities exist only because vast amounts of water are being stored in ice sheets perched on Greenland and the Antarctic. There are 220 feet of sea level rise stored in those ice sheets, and by creating warmer conditions on earth, we will steadily lose that wonderful storage service. In this short video, the CO2 molecule comes to life to explain the situation. Two people I've had the pleasure of interacting with in the past will be in Princeton this week. Your state climatologist (did you know you had one?) will be speaking at 7pm at the Princeton Public Library this evening, Jan. 17. And Jonathan Elbaz, a wonderful, highly talented, super knowledgeable young jazz pianist I jammed with at a dinner party a couple months ago will be performing this Friday, Jan. 19, at Salon 33, a unique performance venue worth checking out. Potluck at 7, performance at 8pm. Highly recommended. For more info and to rsvp, scroll down at this link. David Robinson "New Jersey's Changing Climate"
This special event of the Princeton Environmental Film Festival is co-sponsored by the library and Rutgers Master Gardeners of Mercer County. Jonathan Elbaz, a recent graduate of the prestigious New England Conservatory of Music in Boston, is an aspiring yet impressive twenty-two year old jazz pianist. His talent is quickly becoming recognized, and has already landed him gigs at Dizzy's and other key venues in NYC that feature young topflight jazz musicians. Elbaz is a name to keep watching on your jazz radar. Salon 33 is pleased to host him in his home town of Princeton. Cold nights and sunny days bring memories of the wonderful passive solar homes I've been in, warmed passively in winter by the sunlight streaming in through a bank of south-facing windows. From its low angle in the winter sky, the sun's power pours in to fill a welcoming house with its radiance and warmth. Most homes, including ours, turn a cold shoulder to the sun's winter radiance. To get a sense of how much energy is traveling all the way from the sun only to bounce futilely off the siding, stand in front of a window and feel the sun's heat on your skin. Even with most of the solar energy bouncing off the house unused, there's still canned solar energy in the form of wood foraged locally for the stove. Along with the solar energy streaming through the windows, and one of those really comfortable, lightweight Patagonia coats, it's possible to give the gas furnace a break, and thereby contribute a little less to the radicalization of weather. A wood stove and a sunny south-facing window are like the Victory Gardens of the Second World War. Back then, people became producers, e.g. of food, and minimized their consumption of energy in order to make more available for the war effort. Now, the aim is simply to use less of the unethical energy that permeates our economy--unethical in the sense that present comfort contributes to future discomfort. It sometimes feels like another war needs to be fought, this time against climate change, a self-produced enemy, perhaps the most dangerous of them all. As wars go, it has the advantage that no one need die to win it. But wars aren't as galvanizing as they used to be. Maybe it's time not to make war but to end it, to end the largely inadvertent war on nature. The Third World War, it turns out, is a war not on other nations but on the world itself, waged everyday as collateral damage from our seemingly peaceful lifestyles. We end it by working with nature rather than against it. Our dog is responding to the frigid weather not with worldly thoughts but by opting out of walks, and going out each morning to bark at the cold, as if it were intruding on his territory. Several days later, the barking seems to have worked all too well. Strange cold is replaced by strange heat, much as the drought-enhanced wildfires in Californian have segued to downpour and mudslides. Weather is stretched to extremes, and calls to work with nature seem to arise from a strangely peripheral AsIf world--a dreamed of realm where people think and act as if the future mattered.